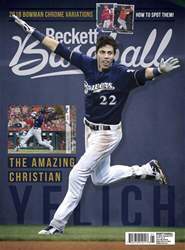 There’s a good chance you have a Christian Yelich Rookie Card or two biding its time in a box somewhere. Even if you recognized his talent early on in a baseball sense, the hobby has lagged behind. For Christian Yelich, it has taken a Triple Crown-caliber season, clutch September play and helping Milwaukee into the postseason. 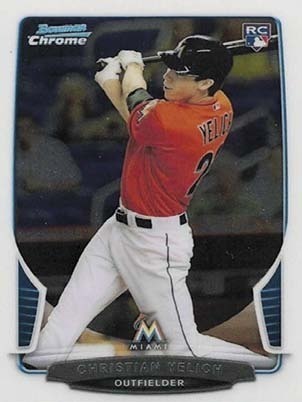 Yelich Rookie Cards are in 2013 sets released in the latter part of the card calendar. That means there really aren’t a lot when put alongside many of his peers. But that also means a healthy number of prospect and minor league cards that came out in the years before. These started in 2010, not long after Yelich was taken in the first round of the draft. The following Christian Yelich Rookie Card list highlights cards that have the RC tag in the Beckett Baseball Card Database and Price Guide. Inserts and parallels are not taken into account. Even as Yelich’s popularity grows, it will be a long time before the base version of his 2013 Bowman Chrome Draft Rookie shakes its affordable label. Collectors are more into prospects, autographs and color when it comes to the line versus vets and rookies.That said, there is lots of color to be found here with a dozen different Refractors.